We accept all major forms of cards at the door with our chip & pin terminal, supplied by iZettle. We also take payment in cash, bank transfer and PayPal. Your windows can be cleaned today using a method which will soon be industry standard. As a company wanting to be at the forefront of our industry, we have decided to invest in this technology which involves the use of telescopic poles and 100% pure water, which we filter through a process of Reverse Osmosis and Deionization. We embrace this technology for a number of reasons. Dirt particles are agitated using a purpose made, soft-brush, and rinsed away using extremely pure water. You may be surprised to know that no chemicals or detergents are required. You should also expect to see the windows cleaned using this method left wet. Don’t worry, this is normal. It may be a little disconcerting at first, since this is not what you may have been used to, but once dry you will no doubt be impressed with the results. Window frames are cleaned every time too! You will likely notice that the windows seem to stay cleaner for longer. This is because there is no sticky soap residue left on the window. Usually rainfall would mix with this soap residue and form little soap spots on the windows. After a little while using this method, all traces of the soap residue will be rinsed away. The rain will then have no soap to mix with and therefore they will appear to remain clean for longer. Something many householders appreciate is that by using water fed poles instead of ladders, there is no more need to worry about the window cleaner suddenly appearing at the bedroom window. No more running around tidying up or shutting the curtains! Legislation now limits the use of ladders as temporary workstations. The Law stats that ladders should only be used when all viable safer alternatives have been considered. Water fed pole systems, like ours, are seen as a safer alternative. 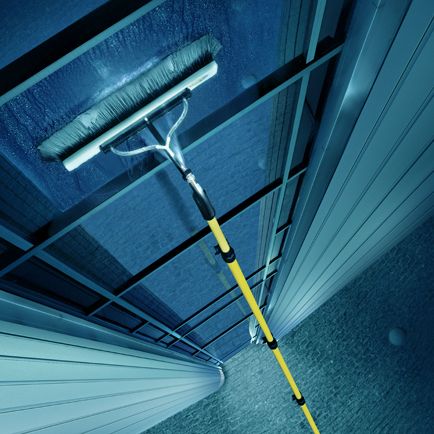 This window cleaning method allows us to do the job to a very high standard and we feel it is a sensible decision to choose to work from the safety of the ground. After all, no matter how careful we all are, accidents can happen to anyone.